Scottsdale, AZ, October 6, 2017 – Roboteq, Inc (www.roboteq.com) introduces RoboAGVSim, a simulator that lets AGV designers program, test and fine tune their Automated Guided Vehicles in the comfort of their PC. A video demonstration of the Simulator can be found at https://youtu.be/3r_vB-9433Q. A Magnetic track guided AGV can be built using only two Roboteq components: An MGS1600 magnetic guide sensor and any Roboteq Dual Channel motor controller. The sensor measures the distance to the center of the track. Using its built-in programming language, the motor controller takes this data and computes the power to apply to the left and right motor needed for the robot to stay on track. 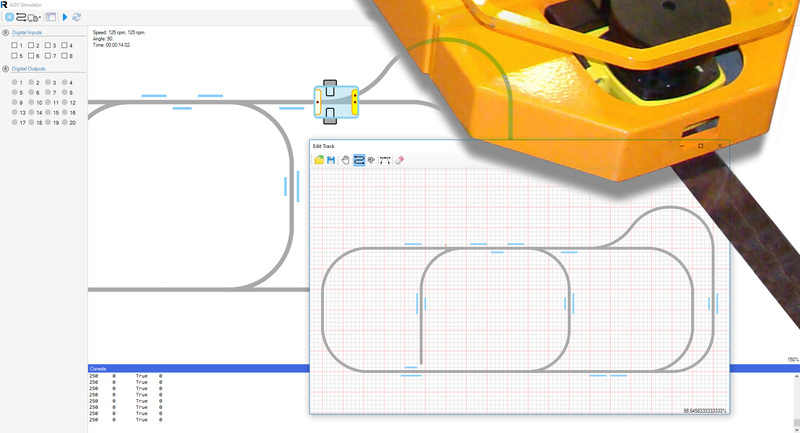 The simulator is very simple to operate: It open with the image of a mobile robot on a blank screen on which users can draw or import a drawing of the track. A source code editor is available for writing the program that will be simulated. A robot icon can then be placed anywhere on the track and made to run. The AGV will move according the user program and uses the Robot’s real physical characteristics, such as wheel base, gear ratio, wheel diameter and sensor distance from the pivot point. Once the program has been verified in the simulator, it can be loaded into the Roboteq controller that is on the real AGV. Founded in 2001 by experts in embedded computing and power electronics, Roboteq’s mission is to develop products and technologies that allow novices and professionals alike to build innovative, flexible and affordable mobile robots. Roboteq controllers are now used in over 10000 original robot designs around the world.